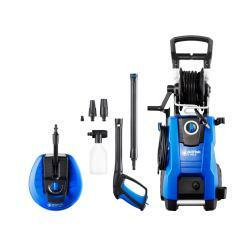 This powerful Nilfisk with long-life induction motor easily handles larger and frequent cleaning tasks. It offers good ergonomics and a large range of operation with its 10m steel armed hose. From gentle cleaning of more soft or sensitive surfaces to blasting away ingrained dirt. It is equiped with many invaluable features, when you need to work for longer periods of time; telescopic handle, sturdy wheels, long hose and one-hand operated hose reel as well as a rubber suspension to ensure lower noise. Sturdy built with alluminum pump and long-life induction motor. 9m soft high-pressure hose and one-hand operated hose reel. Easy storage of gun, lance, nozzles and foam sprayer onboard. Convenient storage of electric cable. Click&Clean nozzle system ensures quick and easy change of nozzle. Can be used as a stationary machine with optional wall hook.